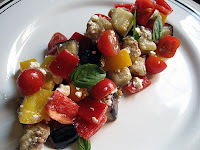 I spied this Eggplant Salad recipe this week in the New York Times food section. The photo accompanying the article was gorgeous. I drooled. I knew I had to try it ... and soon. The recipe was really easy to make. It made way too much for just lil' ol' me, so I shared it with my sis and her hubby, too. Unfortunately, I forgot the mint. :( It got purchased at the market along with the rest of the ingredients, but the basil-mint pesto recipe I made earlier this week also called for mint. I used all I had in that recipe, completely forgetting that I needed a bit for this one. The herb you see in the photo is basil, which basically just acted as a garnish for the photo. I'm sure this recipe tastes really good with the mint in it. 1/4 cup fresh mint leaves. 1. Preheat oven to 425 degrees. Whisk together the oil, lemon juice, salt and pepper.